Conceptually, this is actually a pretty neat product. The XCM-9 is a 9mm drum magazine with a degree of modularity that allows it to be compatible with a variety of popular 9mm double-stack pistols on the market, such as those manufactured by Glock and Smith & Wesson, among others. The ‘magazine tower’ is the component that swaps out, and not only allows for magazine compatibility between various 9mm pistols, but also comes in different tower heights to accommodate for compact and full size profile grips. The total capacity for the XCM-9 is variable, depending on the tower used on the mag, but it maxes out at 69 rounds. 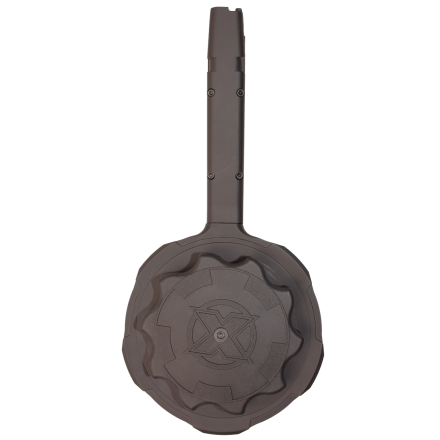 At 5″ in diameter, and sure to be fairly hefty fully loaded, it might be a bit bulky for use with a pistol, if not making for a fun day at the range. However, it seems like it could be a decent companion to a compatible pistol caliber carbine. Available for pre-order now direct from X Products, with a planed launch date within March 2019. This entry was posted on Monday, January 28th, 2019 at 00:38	and is filed under Weapons. You can follow any responses to this entry through the RSS 2.0 feed. Both comments and pings are currently closed.